LITTLE ROCK, Ark. 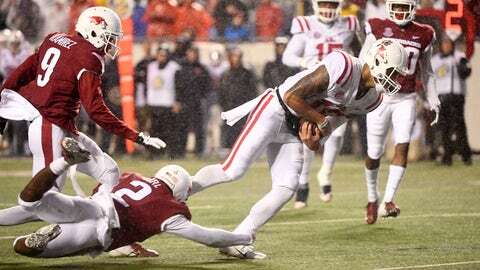 (AP) — Jordan Ta’amu might have only started 12 games under center for Mississippi, but he’s helped guide one of the top offenses in the country during that stretch. The Rebels senior added yet another dramatic late comeback to his growing resume on Saturday night, helping Ole Miss (5-2, 1-2 Southeastern Conference) rally for a 37-33 win over Arkansas. Ta’amu accounted for 528 yards of total offense in the win, 387 yards through air and another 141 on the ground. It was his play on a game-winning 97-yard drive in the closing minutes, however, that helped the Rebels overcome a 17-point deficit once and for all — much like a year ago in a late victory at Kentucky. After starting the drive at its own 3 with 2:02 remaining, Ta’amu quickly completed passes of 20 and 48 yards to move Ole Miss into Arkansas territory. He then rushed for 15 yards, and Scottie Phillips followed with a pair of runs — including the game-winning 5-yard run — to cap the comeback. Ta’amu’s single-game total yardage is the second most in Ole Miss history, trailing only a 540-yard effort by Archie Manning. Not bad company for the former junior college quarterback who has quickly vaulted himself among the SEC’s best in his first full year as the starter. Ta’amu completed 26 of 35 passes and a pair of touchdowns in the win, and he needed 17 rushes on his way to a career-best effort on the ground. “For him to lead a comeback this year and have that many yards rushing and passing, that’s a pretty special night,” Ole Miss coach Matt Luke said. Storey came out of the game briefly in the first half after taking a big hit on a catch he made on a throwback. The junior was unable to return to the game after taking another hit from Ole Miss’ Zedrick Woods early in the fourth quarter. Cole Kelley replaced Storey under center for the Razorbacks, who were already without Boyd and running back Devwah Whaley because of injuries and were unable to score again in the game. Morris said Boyd injured his back and Whaley an ankle in the game, and he said Storey’s status moving forward would be reevaluated on Sunday.